May is here…. here are some ideas to embrace the searing temperatures, and stuff to look forward to. First off, we have edited and compiled our interview with Dr. Sultan Ismail from March. He explains in a simple conversational manner the entire agrarian crisis: what it means to us a consumer, and how it affects our rural economy. Its worth every second of the 25 min video. 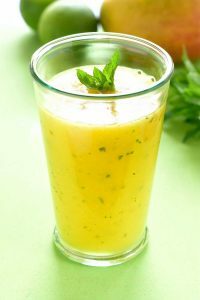 Enjoy the ever favourite Aam Panna as it hails summer. 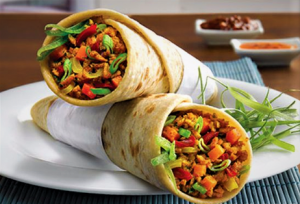 Follow Bhuvana’s recipe and let us know what you think. Additionally, post your own version of this national drink !! 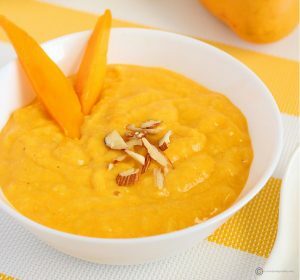 While we wait for the mangoes to land, here is an article that talks about the history of mangoes in India. A very worthwhile obsession that dates back 4000 years. While carbide mangoes have been on the decline, the market has responded to our mango craze with newer ripening techniques, not all of them good. The only way to get great mangoes is to wait for the right time. As they say… Intezaar ka phal meetha hota hai 🙂 Watch as Arifa explains how to spot the artificially ripened fruit versus the natural ones. With rising temperatures comes rising use of fans, refrigerators and a/c. Of these the A/Cs are the biggest electricity guzzlers. Here are some simple tips to use your A/Cs efficiently, and save money on those power bills. If you live in a region that has dry hot air in summer, the use of an evaporative cooler is a much more efficient option. Make sure to install it against an external window, and to have a sunshade above the cooler so the sun’s rays do not fall on it directly and heat it up. If you live in a region that has hot moist air (such as the coastal area with high humidity). turn the a/c on, to no cooler than 27C and turn on a ceiling fan. Movement of cool air against our skin is much more important for comfort, than standing air which could be at a lower temperature. Watch this video by the green architect Ashok Lall on how to minimise dependency on A/Cs, and how to reduce the use of A/Cs, without giving up on comfort and cooling. Summer vacations: Here are interesting summer destinations to visit. Remember, any cool weather place in India is bound to be crowded, so don’t be surprised. Try to find real “off the beaten path” locations, they will offer a much better experience. There are other things you can do, right in your own city, to enjoy the summer holidays. Arrange early morning walking, bicycling tours, late evening concerts, lots of board games with the kids in the neighbourhood, and the best of all, a nice afternoon siesta !! Keep watching our blog section for articles every week. We cover a wide array of topics on sustainability, including organic farming, women’s empowerment, market news, government policy, and more. We also have simple and fun recipes for food every week. Do check them out in our recipes section. Make sure your grocery list for this month is healthy and wholesome. Place your orders here. 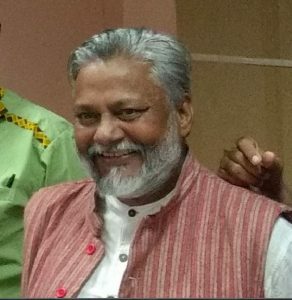 Dr. Rajendra Singh -the Water Man of India needs no introduction. Honoured with the Stockholm Prize in 2015, for reviving the ancient dam technology in the Alwar district of Rajasthan in the 1980s to bring water to 1200 parched villages, Dr. Rajendra Singh has dedicated his entire life to water conservation. Relying on traditional knowledge, local material and the science of common sense, he leveraged community help to rejuvenate nine rivers and restore groundwater levels in Rajasthan. “When the villagers are forced to migrate to cities due to helplessness and hopelessness then cities cannot be healthy. Cities depend on agriculture for their food. Their food comes from the villages. If our rural areas are not healthy, the city can’t be healthy. If the rural areas are not sustainable the Indian city can’t be sustainable. If we want our villages to be self reliant, we have to make them sustainable, the water in the village, the soil, the seeds, the hard work of the farmers, everything is included in this. Without the sustainability of our villages, urban sustainability is not possible. The way our cities are growing with metros, high-rise buildings and heavy traffic, it is not at all sustainable. The basic necessities of a city come from villages and the cost of transporting to the cities these add to the burden of public health. And the pollution that we create in the process, these put a question mark on the way our cities are growing. The public health of the cities is linked to rural health. To correct all these we have to take the route of sustainable development. The meaning of permaculture is to give respect and love for everything that exists in nature. Our love and respect for agriculture will come when we stop using chemical fertilisers, herbicides to cultivate our food. The name permaculture itself means giving respect to nature as it is while growing our food. The viability of permaculture depends on the fact that there is no contract farming done in our country. It should be a contract farming free country. The biggest threat to permaculture comes from contract farming. The trend of corporate farming will not allow permaculture to grow. They will use any term for their farming – chemical free farming, natural farming, zero budget farming, they will come up with a thousand names, but in reality they will be doing business. This will be very dangerous for our agriculture. Agriculture is the foundation of Indian life. It is not a business. It is our cultural heritage, our ‘sanskriti’, it is not our business. Agriculture is the bridge between nature and the needs of human lives. Contract farming and corporate farming is going to break this bridge, because the stakeholders will only be interested in profits. They will not be interested in the culture that envelops agriculture. There will be no love for agriculture in contract farming. Those involved will want to grow stuff that brings in more money. It is my belief that if we are talking about agriculture, we have to examine its foundational principle. We have to examine our soil, our ‘bhoo sanskriti,’ its diversity and its potential to grow food that is good for us, good for the soil and the earth. When my soil health, my water health and the health of my land is good, then I will be good. To keep this chain of good health active, permaculture is the entry point, he concludes. Viewed in the context of the farmers’ march, the intuitive advice from Dr. Rajendra Singh can tackle present day farmers’ woes and will continue to remain relevant in the times to come. Daana supports the cause of sustainable development by supporting small and marginal farmers who grow food without pesticides. Did you wonder why the farmers’ feet bled so much during their march to the Assembly building in Mumbai? I did too. The one word explanation is – Soil. The soil in our farms is teeming with chemicals and it is bleeding the farmers’ feet…. it will get to us as well. If you thought that farming is what gets us food…. that’s just a very small part of the story. Farming is what we do as a nation. It is India’s largest economic activity. It is our national occupation. A bit of a digression is necessary here. 40% of rural India subsists on agriculture, even now. It was 50% earlier. That’s a substantial chunk. If that many people voted for any party in India, the party would get 2/3rd majority, change the constitution to declare themselves as the rulers for eternity. I am being frivolous. The point is that farming is what we as a nation do. It is often a fact lost to most of us who try to ‘solve the problem’ of farming. Farming is, above all, the only sustained employment this country has seen. Successive governments have almost succeeded in discouraging farming folks to give up farming, sell the farms and move to the city to work as labour. Once they are dispossessed of land, they rapidly descend into even greater precarity in the cities. Homeless, landless, jobless. Next time you are entering your office, stop for a moment and ask the security guard where he came from. I bet you five Facebook likes that he gave up his farm to manage your gate security. With that picture in mind, let’s get back to the question of Soil. There is nothing simple about “Soil”. Soil is not just pulverised rock. It teems with life. Each place has a different soil. It changes within yards from soft black clay to being red hard. At times it is just a few inches deep under a sheet rock and at other places it can be as deep as a kilometre. Though we walk on it almost everyday, our understanding of soil as a system is even weaker than our understanding of the galaxies and the stars. Within the first few inches of soil, there are complex and interconnected systems of regeneration, production, consumption and outrageous magic. If you still can, on your next walk, get down on all fours and examine the soil. Use your fingers to scrape it around. Notice the small insects that scurry away. There is a thin layer at the very top that moves when you scrape it. That’s “top soil”. This is where all life happens. Not on TV, not in hospitals, not in the battlefields. Within those two inches, Dr. Ismail said, is where more life happens than at all other places combined. There is no way to measure life, but you get the picture. There are microbes, there are insects, there are worms. There are things in-between. They all eat up each other, digest each other, help each other. The cycle of life is just two inches deep here. Get up now, dust your knees. Into this soil, if you dropped a seed, the soil rallies around and nudges the seed to sprout, push the leaf up, pull the root down. Earthworms have already riddled the soil with holes to make it soft for the sprout to find space, microbes have fixed nitrogen for the sprout to consume, bacteria have mulched the previous generation of plants into food for the new sprout. As the little sprouting pushes itself above the soil, things are getting more interesting under it. One longish root is digging deep into the soil to firmly affix the future plant, the sideways roots are reaching out horizontally to absorb moisture and nutrients. At times, a senior plant’s roots touch those of the young ones, and a bit of elderly help is offered by transferring nutrients between the roots. The soil, it would seem was almost waiting for the seed. On the other hand, if a rodent died, it would be gorged by microbes and composted into becoming one with soil. In reality, soil is just a name for a complex system of millions of different organisms that live there. The farmer needed the soil. A healthy, rich, happy soil to grow on. In 1961 something happened. We had a famine that shook the young nation to the core. Nehru and his team, swore: Never again. We will never run out of food again, they pledged. Just then, Ford foundation, Rockfeller foundation and the rest suggested that we must adopt the best thing since sliced bread – scientific agriculture. It will produce more wheat and even more sliced bread. It looked too good to be true. With modern science at the farmer’s side, we would be able to keep soil healthy, new breeds of crops would grow faster, with greater yield. Dr. Swaminathan was the hero of that moment. The man of science to help the farmer in distress. Get the picture? The only way, asserted the Green Revolution, is to get aggressive with soil and the plants. To increase the yield per acre, you have to make soil “better”, crops “more resilient” and aggressively kill “pests” and “weeds”. This method consisted of injecting “nutrients” into the soil, and force feed plants by flooding fields with water. To keep weeds and pests away, they introduced a range of chemicals that will wipe out every living thing on the farm. It is like providing your army with gas masks and releasing nerve gas in the city – staple theme of almost every superhero movie. Well, the analogy isn’t very far from the truth. Many of the chemicals were actually chemical weapons used in Vietnam and Korea. Here is an analogy. To be a productive individual, you need to be happy and healthy. How do you do it? You exercise, get clean air, eat in moderation, have a healthy work/life balance and be nice to everybody around. Now, instead, I give you a deal : why bother with all that? Chuck your home life and start living in a Hospital’s ICU. For food, we will feed you a steady diet of vitamins, proteins, carbs and micronutrients, for happiness there will be Prozac. We will inject you continuously with the best antibiotics money can buy, so that no bacteria will ever bother afflicting you. Air is completely filtered and clean, you get to wear a new scrub everyday and someone will give you a sponge bath while you sleep every night with intravenous sedatives. Deal? Deal. The Punjab farmers took it. That was the laboratory. The results were mind blowing. The productivity jumped up many times over. India’s days of starvation were over. The grainy film documentaries, the mandatory viewing before a masala movie showed flowing fields with wheat and paddy, set to the fast jhala of Pandit Ravishankar’s sitar. Food? Done. As the Green revolution spread itself all over the country : from Punjab to Maharashtra to Andhra Pradesh, there was celebration in the air, and problems on the ground. Farmers started to notice that the chemicals that were meant to kill bad things also killed the good things. Killer chemicals don’t distinguish. Termites, microbes were all dead. Soil collapsed. The earth became rock hard. Tractors were brought in to till the hard soil. The tractors killed the earthworms. The plants that took in the fertilizers needed inordinate amounts of water but the water didn’t seep into the hardened earth. So, more water to quench the thirst. Dams had to be built. Water had to be diverted, forests collapsed. To fix one thing, another thing was broken. That broke yet another thing, so on and on it went. The cascading effect was dramatic and catastrophic. The farmer needed money to buy more medicines, I meant the fertilizers and pesticides to keep going. Each year, they needed more of the same. The cycle of debt set in. Chemicals seeped into the soil. Now, you know why their feet were bleeding. Doesnt stop at the feet. Cancer is rampant among Punjabi farmers. Children are born with gene injuries. Last year Rs.500 crores were paid as compensation to Kerala farmers for suffering from the ill-effects of Endosulfan. The stuff that goes into Indian soil is not even touched by anyone outside India. In many countries, if you were caught with it, you’d be booked for possessing chemical weapons. Then, what will we eat? Is there any better way than this? If we do not produce more, how will we eat and what should we eat? Let’s look at the second question first. 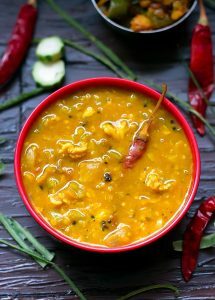 Over the last century, Indian taste buds have been hugely affected by ads and marketing: Basmati Rice, Sharbati Wheat, etc. These are very water intensive crops that have low yield per acre. 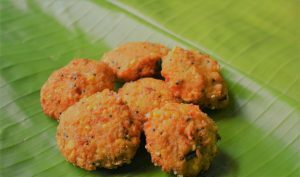 So, there will be enough to eat if we begin to relish more millets, and dals in our diet. 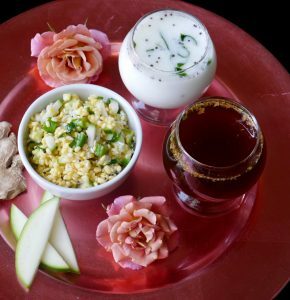 If we eat more seasonal fruits, if we start discovering the Indian foods from before the 70s. I am not being a luddite, just being practical. The other question ‘Is there a better way’ is an interesting question that has an interesting answer. In short… YES. There is a better way. To begin with, it was a myth that the chemical way of farming gave magnitude of a larger yield. It is now thoroughly debunked. Over a long term of ten years, a farm will produce not more than 25% more than what it would produce naturally. That is just volume-wise. On the other hand, if you look at the cost of production, naturally grown food wins hands down. Everything from pests to weeds at soil health can be taken care of without needing intensive money and aggressive technology. It must begin with first, respecting farming traditions: there is an evolving knowledge base that is a result of slow weeding out of bad ideas and assimilation of the good practices through experience, and multiple growing cycles. In other words, farming is as scientific a pursuit as it gets. So, respect traditional ways. They are not based on mumbo-jumbo of superstition. Don’t assume that a limited test tube hypothesis is automatically superior to what a farmer knows, just because she wears tattered clothes and doesn’t speak English. Seek inspiration from Albert Howard who ironically was hailed in the west as the “father” of modern organic farming, for having learnt and disseminated traditional farming practices of India. Second, we must disseminate these ideas of natural farming in new ways and make them contemporary. This is the sort of work that people like Masanobu Fukuoka, Bill Mollison have discovered, curated, documented and spread. It is a tough challenge to promote a self sustaining method of feeding the world in the face of some of the most aggressive propaganda by the world’s most aggressive companies. The natural farming community needs all of us to stand by them in solidarity. We will talk about the ways and means to get back to natural farming in cost-effective and sustainable manner in future posts. This one was just about what I learnt from Dr. Ismail Sultan. Narsanna was not wrong when he called him “Soil-tan” of natural farming. Here is a great TED talk by him. Have a great weekend. A woman is like a tea bag. Put her in hot water and you will see how strong she is. We have all heard this one at some point. Time and again women have shown that they are adept at managing home, hearth and work with equal ease. This year Nari Shakti Puraskar was given to 38 women. Notable among these are the All India Millet Sisters Network, Deepika Kundaji, Vanastree and Sabarmati Tiki. All of them are working in rural areas, with women in agriculture, promoting neglected grains and traditional seeds. The Hyderabad based All India Millet Sisters Network (AIMS) is the first of its kind women millet farmers in the country that is dedicated to the cause of the neglected coarse grain. Millets are a traditional crop in the country and this network has brought together women farmers who are cultivating and conserving millets. It was set up eight years ago with 100 women. Today, it is a network of 5000 women across the country. 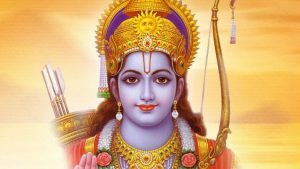 The story of Anjamma is an interesting one. She is a poor farmer from Telengana. She preserves seeds in a traditional way without using any chemicals. She stores seeds for next season in a cane basket, using easily available ash and neem leaves and seals them with cow dung and mud. Despite a drought spell and zero rainfall she reaped eight quintals millet and six quintals of toor dal from her bio diverse farm. 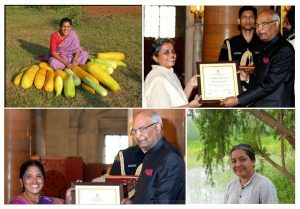 Her work in keeping alive a traditional knowledge system in the preservation of seeds was recognised by Protection of Plant Varieties and Farmers Rights Authority, India (PPVFRA). There are many stories like this one and they are getting noticed by none other than the Minister for Women and Child Welfare, Maneka Gandhi who is an environmentalist herself and rooting for women farmers. Read about the rest here in her own words. Daana salutes all the women engaged in farming and seed preservation.